This movie tells the true story of Pfc Desmond T. Doss (Andrew Garfield). Doss won the Congressional Medal of Honor despite refusing to bear arms during WWII on religious grounds. Drafted and ostracized by fellow soldiers for his pacifist stance, he went on to earn respect and adoration for his bravery, selflessness and compassion after he risked his life — without firing a shot — to save 75 men in the Battle of Okinawa. Tortured souls make for brilliant artists. Mel Gibson is a brilliant artist and he paints his canvas through a lens. For all the great work he’s done in front of cameras, his masterpieces are born the moment he steps behind them. From Braveheart, to The Passion of the Christ and now Hacksaw Ridge. In telling the true story of a member of the Seventh-day Adventist Church who refuses to bear arms, Hacksaw Ridge manages to rise above other war movies. 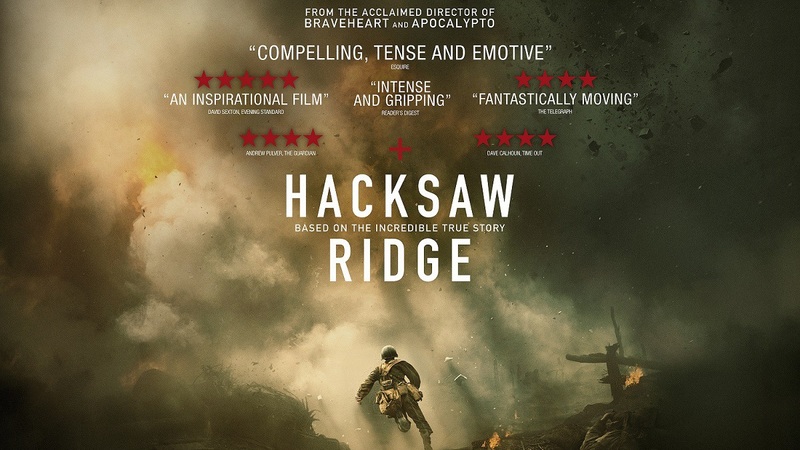 Brutal and honest in its depiction of war, this film does a great job of making you feel something. What that something is depends on your beliefs. You might walk out of the theater with tears in your eyes or perhaps shocked or proud, all are acceptable reactions. Truth is, this is a must see film because it does something that few films seem to do lately and that is make you think. Think and feel. Think about how hard it must have been for Desmond T. Doss to stand up to the military machine in a time of war. Think about what you would have done if you were him. Feel the weight of those choices. Andrew Garfield is at his best as Pfc. Doss, the soldier who refuses to kill. The supporting cast shines through their interactions with Doss. Vince Vaughn provides comic relief without disrupting the tone of the film. His performance could earn him some nominations come award season. The truth is Mel Gibson delivers yet again and should be in consideration for a couple of awards himself. Think what you will of him and his past behavior (his name is not on any posters for a reason), he did an amazing job. Rupert Gregson-Williams was in charge of the score. Adding depth without taking anything away from whats happening on screen. The cast for this amazing movie includes Robert Morgan, Nico Cortez, Daniel Thomlinson, Goran Kleut, Luke Pegler, Milo Gibson, Harry Greenwood, Firass Dirani, Richard Pyros, Luke Bracey, Andrew Garfield, Jacob Warner and Sam Worthington round out the cast. I give this a solid 4.5 out of 5 starts. It is a great movie, with a great story told by a great director and full of great performances. I know, that’s a lot of greats, but after you watch this film you’ll understand. At the screening I was at, people cried, talked about knowing what the soldiers felt (being soldiers themselves) and were generally satisfied with what they saw. If you’re still on the fence about whether or not to see this film, at least watch the trailer below before making your final decision.